Although clean water from geothermal wells accounts for approximately 90% of our house heating demand, the remaining 10% rely on electricity although it´s a lot more expensive. One of the communities where geothermal water is hard to find. 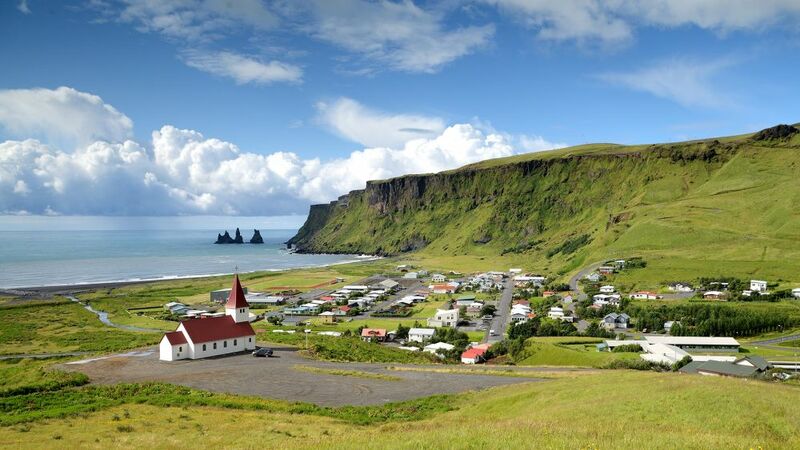 The picturesque village of Vik, located at the southern coast of Iceland. Together with a team of companies and individuals we have recently built and installed a variable capacity heat pump for the school & swimming pool buildings in Vik, resulting in approximately 75% energy savings. For those interested, please click the link below for real time information. Our contribution: Project appraisal, drilling & well testing. Heat Pump design and installation. Sölvi Traustason: Heat Pump chassis, accumulator tank & other stainless steel structures. www.samey.is Electrical items, PLC & communication. www.vsb.is “In house” heating system design and project management.